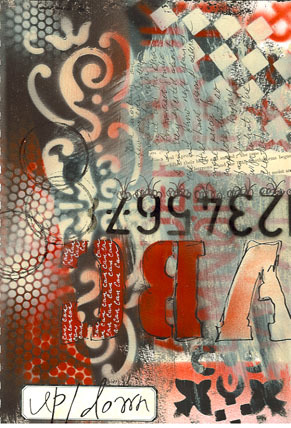 Journal Page Elements: stencils, spray paint, rubber stamps, black pen, acrylic paint, white pen, glaze and black dye ink pad. I am so excited for artist Bridgette Guerzon Mills. She has been preparing for a solo art show that will be opening on Friday, October 5 at Fifth Avenue Art Gallery in Melbourne, Florida. The show will hang for the month of October (1st through the 28th). The show is called Expecting: explorations in mixed media. If you are in the area, be sure to check it out! Her work is very inspiring! Daily Journal Prompt: What fear would you like to overcome?